Garlic mustard beginning to crowd out toothwort. Early last week Allison Cisneros was walking along a wooded trail with her eyes to the ground when she spotted a patch of young toothwort, one of the hundreds of native wildflowers and plants the U.S. Forest Service wants to encourage in the Midewin National Tallgrass Prairie near downstate Wilmington. "Oh yeah, this is gonna be a little doomed patch," she said. "They're gonna die or their seeds aren't gonna be able to germinate when they drop." The threat was coming from another small green plant that had begun to poke up just below it—Alliaria petiolata, or garlic mustard, an invasive flowering weed that's been crowding out native species at least since its first documented appearance on Long Island in 1868. Garlic mustard quickly muscles out other species by dominating light and space, and because it's allelopathic—meaning it releases chemicals through its roots that inhibit the growth of root fungi that native plants like toothwort, spring beauty, and trillium need to thrive. If it's allowed to flower and go to seed unchecked it can thoroughly infest whole understories of forest and prairie. Each spring the U.S. Forest Service promotes its Garlic Mustard Challenge, in which local groups across the country scour "Cooperative Weed Management Areas" for the pest and yank it up by the ton. 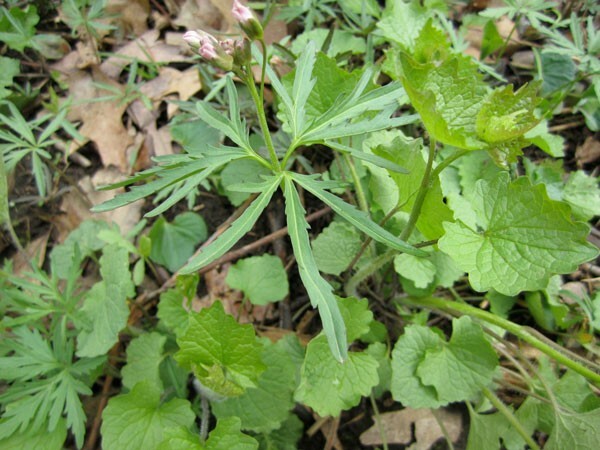 Here at home, the Northeast Illinois Invasive Plant Partnership has already collected 10,800 pounds, and has pulls scheduled through the end of May in areas as wide-ranging as Midewin, the Lake County Forest Preserve, the Hegewisch Marsh, and Illinois Beach State Park. Cisneros is the volunteer coordinator at Midewin, and in addition to marshaling frog monitors and seed cleaners, each spring she leads a few garlic mustard pulls on the 19,000 acres of the former Joliet Arsenal, where the U.S. Army and later the Honeywell corporation manufactured dynamite and artillery shells up until the 80s. Unlike invasives such as, say, Osage orange, garlic mustard has one attractive quality that plays at least a small part in its appeal to some volunteers. Its leaves and stems taste like garlic—which is why I asked Cisneros to take me out along the trail in advance of her first volunteer pull of the season last Saturday. By most accounts, unspecified "early European settlers" take the blame for bringing garlic mustard to North America for use as a culinary herb with alleged medicinal purposes (according to one Columbia University researcher it was used to treat gangrene and ulcers). Here it doesn't have any competitors, and nothing—apart from humans—will eat it, which helps it flourish. But workers at Midewin face an additional problem in that bulldozing larger invasive bullies like Osage orange, autumn olive, and honeysuckle disturbs the soil—which actually encourages garlic mustard to take root before native species can be introduced. As we walked along a mile-and-a-half-long trail, we found lots of the stuff, both in isolated bunches and larger patches. Once we walked off the path and deeper in the woods it became more scarce. Tom Smith, the stewardship coordinator of the Lake County Forest Preserve, says it always comes back first in Ryerson Woods near where some cabins were built in the 40s. In some areas it's so entrenched that the challenge is simply holding back wider infestation rather than eradicating it. Neither Cisneros nor Smith eats it much. "After pulling it for like five hours it really gets up your nose," he told me. "You smell it for a long time afterwards." Frankly, I was surprised at how mild the stuff I picked up was. Eaten raw in a salad its garlicky flavor was slight but certainly noticeable, with a touch of bitterness. Cooked or pulsed into a pesto—which is one of the most common recipes you can find online—that assertiveness almost completely disappeared. It's not gonna ward off any vampires. But urban forager Nance Klehm told me to wait a bit longer: with a few more hot dry days, it will get stronger. "I probably eat it casually a couple times a week," she said. "It's one of those kinds of weeds people are surprised and excited about. So it's a pretty easy sell for the middle palate." But for someone with more adventurous tastes, "I don't think its very interesting," she said. "It's just one of many things out there to eat. " It does have its fans. Food & Wine once published a recipe by Jean-Georges Vongerichten for black bass with burdock root and garlic mustard. The CWMA at Maryland's Patapsco Valley and Heritage Greenway put together a collection that grew out of its garlic mustard recipe contest, including garlic mustard pineapple upside-down cake, venison garlic mustard sausage, and garlic mustard chipped beef. Iliana Regan of One Sister, Inc., finds it all over her gardens this time of year, and she likes the greens too. "They are awesome in salads," she wrote me in an e-mail. "They can be lightly sauteed, turned into pestos or vinaigrettes. They are best when young, as most foraged greens/weeds are." She sent me recipes for garlic mustard compound butter, pork-fat-braised garlic mustard with roasted garlic, and a "sponge" of sunflower, garlic mustard, and arugula she's featuring on her current underground dinner menu (find the recipes on our relaunched blog the Bleader). You can also check out a garlic mustard cocktail Sable bartender Mike Ryan devised for our new drinks feature, Cocktail Challenge. If you want to try any of them out you needn't go as far as Lake County or Midewin for your own supply of weeds. Right now, it's coming up all over the place in the Cook County Forest Preserve. And I found it growing with abandon in a flower bed in front of a stately Ravenswood Manor home. It's a tenacious plant. Just make sure you take it out before it blooms. One week after I picked it with Allison Cisneros, a bowl of uprooted garlic mustard I'd left on my back porch began to blossom with tiny white flowers. Tags: Food & Drink Column, U.S. Forest Preserve, Garlic Mustard Challenge, Jean-Georges Vongerichten, Food & Wine, Iliana Regan, One Sister, Inc.